In September 2009, Ride2Recovery auctioned a dinner experience with Todd and Sarah Palin, the proceeds of which benefit the organization’s wounded warrior efforts. Cathy Maples, President, R & D Electronics was the winning bidder. Precise scheduling arrangements cannot be discussed; however, Ms. Maples is looking forward to dining with Governor Palin. 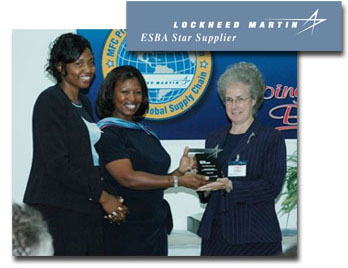 Nicole Champion (left), ESBA STAR Program and Jan Tingle (center), PSP Program coordinator, present the ESBA Star Supplier trophy to Cathy Maples, President of R&D Electronics, Inc. Following is the complete transcript of an interview of Cathy Maples by Ron Devito, Editor and Publisher, US for Palin. Devito: Tell me a little about yourself. Maples: I am a 53-year-old female and I own my business. I went to work in the shop for R & D Electronics, straight out of High School and attended College at night. I worked my way up in the company and in 1993 was afforded the opportunity to buy majority interest in R & D. After writing an extensive plan for the bank; a loan was approved which allowed me to become majority shareholder at R & D. I have spent 18+ hours a lot of days because I didn’t have the resources to hire additional people to help. My passion is to lead my small business to further success by providing jobs, funding for our local schools and support to my community. I have two handsome grandsons who I spend a lot of time with now and I am trying to get them involved in participating and helping our country get back on the right track. Maples: I heard the Ride 2 Recovery auction advertised on TV. I then went to the internet and did further research on it. Devito: What prompted you to bid? Maples: Again, my grandsons are at a formative stage in life and I wanted them to experience being around someone in politics that wanted what is best for the United States in lieu of politics as usual. Devito: What is your personal connection to wounded veterans? Maples: My brother spent 20+ years in the Army, he served in Viet Nam where he contracted Leukemia from Agent Orange (We lost him to Leukemia). I have a nephew in the Army now and had two other brothers who served in the Army. I work closely with defense contractors and have seen firsthand the patriotism of some of these men who serve our country. I have seen tears in the eyes of colonel’s when they have talked about our soldiers in the field and the equipment and support these guys need to perform their job. Devito: Though the principal purpose of a dinner such as this is to help wounded veterans, you will be in Gov. Palin’s company for up to four hours….please elaborate on your opinion and support of her. Maples: I like that she is for smaller government, less taxes and the government being on the side of the people. She understands that the Senators, Congressional people, and the President are hired by the people to work for the people (I don’t believe some in Washington are aware of that any longer, they belittle the opinions of the voters). I believe she would listen to the people who elected her and want what is best for our country in lieu of politics as usual in Washington. Devito: You thought well enough of Gov. Palin to want to dine with her….post-dinner….what are your hopes or plans as they relate to Gov. Palin and your support of her? Maples: I would love to see her in the White House in 2012. If we continue spending another three years plus four more years at the rate we have the last 12 months, I am afraid the United States as we have known it will no longer exist. I don’t like my grandchildren already being in debt for the current generation to frivolously spend on the pork barrel projects and on other projects that have no meaning. If government would back off, lower taxes and revert back to the way business was done under President Reagan we could have a full recovery. Devito: Same question as directly above, but related to wounded veterans, Ride 2 Recovery, or other organizations such as Wounded Warrior Project, Fisher House, Homes for our Soldiers, etc. Maples: Again, I fully support our veterans through my prayers and through monetary consideration. I am thankful for the freedom I enjoy every day and I know it is because a veteran fought and sacrificed for it. I think it is very important that all soldiers know they have our support and feel honored to tell all I see in my business travels how thankful I am for their service to our wonderful country. I have donated to Wounded Warrior and Ride 2 Recovery. I have approached soldiers in the airport while traveling and thanked them for their service to our country and the freedoms we enjoy because they fought for our country to be free. Devito: Anything else you wish to add? Maples: It is time to take America back. The hope and what little change is going to be left after paying for bigger government is not going to work. I want Americans to send a message to Washington and not re-elect the people who voted against what the people wanted, and used back door deals such as the one in Nebraska and Louisiana. The votes Ben Nelson and Mary Landrieu cast was not for a changed policy on health care, but a deal that would benefit their state only. I liked McCain’s platform, “Country First,” but it is evident with the current administration that it is certainly not Country First. Ride to Recovery, Wounded Warriors eBay auction!